Axel Schülzgen holds a preform, which can cost as much as $30,000 apiece. His team feeds the preforms into a furnace in the fiber draw tower behind him. The molten glass is shaped into the fibers used for fiber optics and wrapped around the spool in the foreground. The grant will purchase equipment enabling the team to make their own preforms. A UCF optics researcher has received the state of Florida’s only equipment award from the Air Force’s Defense University Research Equipment Program (DURIP). Axel Schülzgen, a professor in the College of Optics and Photonics, and his colleagues were awarded $870,000 to purchase equipment that will create the glass preforms necessary for producing fiber optics. Optical fibers are the backbone of most telecommunications systems, transporting vast amounts of data via the internet and telephone connections, and fuel a multi-billion global industry. With the new equipment Schülzgen and his team will be able to make their own preforms – cylindrical chunks of glass – the raw material for fiber optic cable. Preforms, which the researchers currently have to buy for as much as $30,000 apiece, are fed into the furnace of a fiber draw tower where the molten glass is ultimately stretched into the fibers integral to fiber optics. 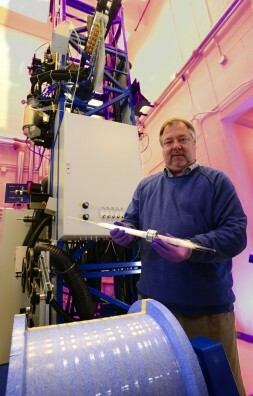 Schülzgen and his team specialize in creating fiber optics with the fiber draw tower customized for and installed at UCF shortly after his arrival in 2009. The tower is something typically found in large industry labs however Schülzgen is pleased to be able to offer students in the College of Optics and Photonics the ability to learn the state-of-the-art methodology on real-world equipment. “With this addition to our tower we will have a one-stop-shop for creating fiber optics here at UCF,” Schülzgen said. After the fibers are created they are jacketed, wrapped in bundles and are used to carry data across oceans and continents. This is the technology that enables fast optical communications through a globally connected internet. The modified chemical vapor deposition (MCVD) lathe system purchased by the grant will allow the center to produce a wider variety of fibers and participate in more specialty research. By September CREOL will complete construction of a new facility in the Central Florida Research Park to hold the new lathe system.